The Scottsdale Best Businesses Award Program is an annual awards program honoring the achievements and accomplishments of local businesses throughout the Scottsdale area. Recognition is given to those companies that have shown the ability to use their best practices and implemented programs to generate competitive advantages and long-term value.Each year, the Scottsdale Best Businesses Award Program identifies companies that we believe have achieved exceptional marketing success in their local community and business category. These are local companies that enhance the positive image of small business through service to their customers and our community. These exceptional companies help make the Scottsdale area a great place to live, work and play.The Scottsdale Best Businesses Award Program was established to recognize the best of local businesses in our community. Our organization works exclusively with local business owners, trade groups, professional associations and other business advertising and marketing groups. Our mission is to recognize the small business community’s contributions to the U.S. economy. 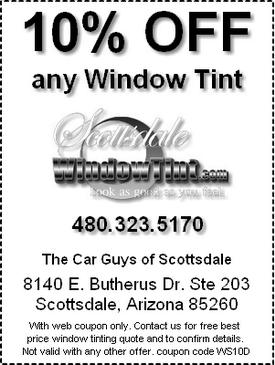 ScottsdaleWindowTint.com has been recently awarded the 2014 Scottsdale Best Businesses Award for "Auto Glass Services" in Scottsdale as the best local Scottsdale business for Window Tinting in Scottsdale AZ. The main focus is on companies that have demonstrated their ability to use various marketing methods to grow their business in spite of difficult economic times... Our company chosen was to exemplify the best of small business; often leading through customer service and community involvement. For most companies receiving this award, this recognition is a result of our daily dedication and ongoing efforts within the Window Tinting Industry in outstanding marketing, sales and installations as well as the work of others in our organization that have helped build our business. Our dedicated and professional team at www.ScottsdaleWindowTint.com is now a part of an exclusive group of small businesses that have achieved this selection by the array of select and individual Scottsdale Best Businesses nominated and chosen for 2014.